Looking for dog names ending in Y? Finding the right name for your new dog or puppy can be a hard job. Since we have quite some experience with how hard this can be, we decided to help. On 123Tinki.com you can find a database of over 40.000 dog names and we have a very handy tool to help you sort out the names from the database that you might like. This tool is our dog name generator. Besides helping with finding the right name we can also help with other things. Recently Tinki launched an online puppy training to help you get through the first days with a puppy at home. Later, you will also find online training for other aspects of the dog’s life as well. All in all, Tinki is here to help you! Our dog name generator is a handy tool to help you sort out the names that you like. Maybe you have just started looking for names and have no idea what you would even like, in that case the generator is very useful as well. The generator gives you access to our database after filling in a few details. Once inside the database you will find a panel with filters on the side. These filters can be switched on and off to whatever you prefer. For example select ‘Disney’ and the generator will show you all the Disney dog names from our database. This way you can also find dog names ending in y sound. Under this panel, where you will find the filter ‘ending in y’, you will also find things like ‘two syllables’ or ‘starting with A’. This way you can make combinations as well. By selecting the gender, theme, type and sound you can create your own personalized list of suitable dog names. Play around with the generator and find anything you like! French dog names, University of Alabama dog names, dog names starting with E, dog names that mean red, unique dog names, chocolate brown dog names.. Anything! Is there such a thing as the perfect dog name? Of course there is! Whether you want a Spanish puppy name, a Disney dog name, a city dog name or a Southern dog name, it will always be perfect. As long as you believe that the name is perfect, it most definitely is. Remember this and make sure you choose a name that you absolutely love. Don’t settle for good, settle for perfect! Keep searching and sniffing, eventually that one perfect name will definitely find you! Now of course there is something that you should kind of stick to, not really a rule but it is good to remember and keep in mind. Make sure that you are always able to pronounce the name clearly. This means that you should choose a name that is not too long, longer names are often shortened into a nickname and that will confuse your puppy. Keep the name simple so your dog can always understand you. When it comes to finding that one perfect name for your dog there are many things you can and take in consideration. Each of them equally important but there is one thing that stands out. Which is that it is your choice. You decide because he is your dog. Remember that. Besides this we have a few more things we would really like you to remember in your quest for the perfect dog name. When it comes to a dog’s name, the sound is really important. Your dog should be able to understand you at all times. This means that the longer and complexer the name is, the harder this will be for your dog. Besides that, it will also be harder for you. You have to be able to pronounce the name clearly. You might be able to call a long and complex name clearly but when you find yourself in an emergency situation, this will be hard. Names are easily shortened and calling your dog Alex one day and Alexander the next will be extremely confusing. Especially if your dog is still a young puppy! With this we do not actually mean that it is important to know what the name literally means. What we mean is the way your dog perceives it. To your dog, the name is a command. It means ‘Hey, I have to pay attention.’. 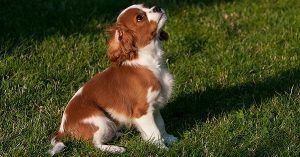 Dogs are smart enough to realize that after hearing their name, another command will soon follow. If you understand this, the tip above also becomes clear. Because every command we teach our dogs are short and clear terms. The name is like a command, so it should be short and clear as well. This does not mean your dog does not feel the emotion of his name or rather, your emotion. If you feel upset when calling the name, your dog will definitely feel it. Maybe you do not even have to call his name. Isn’t that the beauty of the relationship between man and dog? What is important about the literal meaning of the name is that you should check if the name is not offending. Maybe you have picked a name in a different language or maybe you have just picked a name and have no idea if it is from a different language. Always best to check, you do not want to offend anyone when calling your dog in the dog park! As mentioned before, picking a name for your dog is your decision. You do not have to rush this decision either. What is important is that you eventually pick a name that you absolutely love. To find that name, you might need your time. Of course it is not bad if you found the perfect name within a short amount of time but if you feel a bit lost or feel like you are lacking behind, you are not. Scroll through some different lists of names again, look at your own list, get creative! Eventually the right name might just find you..
All over the world, there are about 1 billion dogs. Of these 1 billion, there is only a sheer number of 170 million dogs living amongst families. The rest are strays. This is also why the number of total dogs in this world is an estimated number. You of course aspire to be or are one of those loving families, which is great news. Because we believe every dog deserves a loving home, and a beautiful name. Sadly, not every culture sees dogs that way. In some cultures dogs are seen as food and well, in some cultures dogs are dressed up with clothing.. Dogs as pets has a long history and so does giving them names. When mankind first started domesticating dogs, they probably did not name them yet. What we know from a few decades back is that sometimes dogs were also simply called dog. Dog names have also developed throughout the years! The first dog name ever, or at least what has been recorded in history, would be that of a dog in Ancient Egypt in the time of the Etruscans. In that time, only noblemen and kings were buried with honors, which is important to the story. During the Harvard-Boston expedition in 1935, led by George Reisner, they stumbled upon an inscription on a grave in the great cemetery west of the Pyramid of Cheops. This inscription showed the burial of a dog named Abuwtiyuw. Abuwtiyuw turned out to be the dog of Egyptian king and was buried with honors. After Abuwtiyuw died, the king gave him his own grave because he had worshipped him so much.Besides Abuwtiyuw there are of course many famous dogs in history. Maybe one of the following has a name that will suit your new puppy? A famous dog that lived not so long ago is the small street dog Laika. Laika was a stray from the streets of Moscow and picked up by professors to train her for space. They trained her to stay in confined spaces and feed of fluid food that can be brought on a spacecraft. Laika was the first living being to orbit the earth! Sadly, later research showed that Laika had already passed a few hours into the trip due to stress and heat. Also, the spacecraft Laika was in was designed to burn up in space so Laika would have never come out alive. Another famous dog from history is actually more of a television character but still, you must definitely know her. Lassie, the long haired Collie from the movie called Lassie. In the movie, Lassie is on a mile long journey to reunite with her family. Later, there was also a television series that continued the story. Of course, when we are talking about famous dogs in this article there has to be one dog name ending in y in there. He might not be such an incredibly famous dog but his story is definitely heroic. 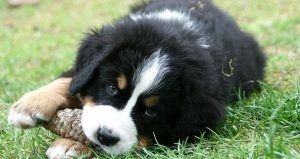 Barry der Menschenretter (also know as Barry) was a St Bernard that worked as a mountain rescue dog. He lived in a monastery near the Swiss-Italian border and saved the lives of over 40 people. Of course there are many more famous dogs, and a lot more names! We hope that so far, you have gotten inspired. Maybe you are able to add a few names to your personal list of possible dog names, or maybe you have found the one perfect name already. Either way, we hope you will succeed! Last but not least a few dog names ending in a ‘y’ sound.